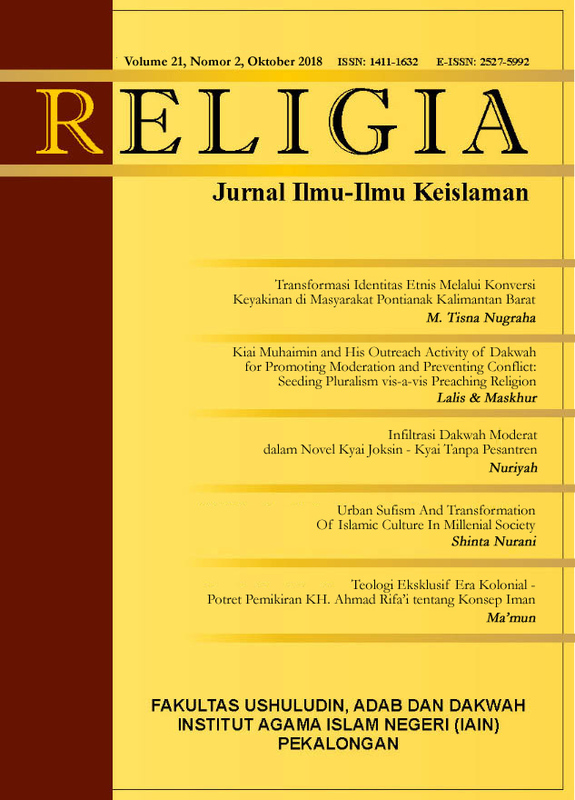 Religia is a periodical scientific journal with ISSN Print: 1411-1632; Online: 2527-5992 published by the Faculty of Ushuluddin, Adab and Da'wah IAIN Pekalongan. This journal specializes in the study of Islamic sciences (Islamic Theology, Philosophy and Islamic thought, Tafsir-Hadith, Science of Da'wah, and Sufism). The managers invite scientists, scholars, professionals, and researchers in Islamic scholarship disciplines to publish their research results after the selection mechanism of the manuscript, the review of the partner bebestari, and the editing process. The Religia Journal is published in April and October each year. This journal has been indexed in a reputable national indexing agency.